Anti-wind forces plan to flood the meeting of the Town of Sherman (Sheboygan County) board to protest a four-turbine project proposed by Emerging Energies, a Wisconsin company. The town board members need to hear from pro-wind advocates like you! Can you possibly attend a pre-meeting at 5:30 on September 4 at Kettleview RE and then go to the public hearing? Maureen Faller, co-owner of Kettleview RE, wrote a terrific guest column to lay out the benefits of wind energy, and she will lead the pre-meeting to give you ideas for what you might say if you want to speak during the public hearing. You don't have to say anything, if you don't want to. Your presence will speak volumes! The anti-wind forces ran ads in local papers to turn rally more people to their obstructionist effort. We're up against well-funded, well-organized zealots! From an article in the Journal Sentinel, read the whole article here. The notion is intoxicating: Capture the wind that has buffeted boaters on the Great Lakes for centuries and convert it into clean, renewable energy. But one important piece of data has been missing: We don't know exactly how windy it is out there. A floating research platform launched to collect data on wind speeds high above the water in the middle of Lake Michigan has begun feeding the information to researchers involved in a $3 million project. "We're capturing some of the very first data," said Arnold "Arn" Boezaart, director of the Michigan Alternative & Renewable Energy Center at Grand Valley State University in Muskegon, which is leading the research. "The wind data that we're bringing on shore - when I brought the first data cards on shore, I felt like I was bringing gold bullion." The WindSentinel research platform, funded by the U.S. Department of Energy, the State of Michigan, We Energies and the Sierra Club, uses laser-pulse radar technology to gather information about wind speeds at heights in excess of 500 feet above water. A partnership of Axys Technologies in Vancouver, British Columbia, and a Virginia company called Catch the Wind incorporated the laser and radar technology into a wind-measuring platform that is powered with renewable energy sources - primarily wind and solar, but also biodiesel. The platform was the first one deployed in North America and the only one on the Great Lakes. Another was deployed recently in the Atlantic Ocean off New Jersey. Previous Great Lakes studies have indicated there are strong winds midlake, but wind monitors in the lake today measure wind speeds at only 10 to 12 feet off the water, well below the height that would be used to generate electricity from wind. There has been no hard data documenting wind speeds at the height where a turbine's blades would turn. Preliminary results from the new project look promising: Data from June showed an average wind speed of 22 mph 410 feet above the water. "Based on our early assessments of the average data that we're gathering, there clearly is a very robust wind resource out over Lake Michigan," Boezaart said. Wind speeds over 15 to 20 mph are considered commercially viable for wind generation, he said. From an article by Tom Content in the Milwaukee Journal Sentinel; read the whole article here. The notion is intoxicating: Capture the wind that has buffeted boaters on the Great Lakes for centuries and convert it into clean, renewable energy. But one important piece of data has been missing: We don't know exactly how windy it is out there. A floating research platform launched to collect data on wind speeds high above the water in the middle of Lake Michigan has begun feeding the information to researchers involved in a $3 million project. Based on our early assessments of the average data that we're gathering, there clearly is a very robust wind resource out over Lake Michigan," Boezaart said. Wind speeds over 15 to 20 mph are considered commercially viable for wind generation, he said. Thanks for stopping by the RENEW Wisconsin booth or talking with me at the Polk County Energy Fair. RENEW is the organized voice for clean renewable energy in Wisconsin, and as a membership organization, we critically need your support to effectively advocate for businesses, organizations, and individuals who seek more, clean renewable energy in Wisconsin. We have an aggressive agenda for the remainder of 2012, and by working together we can organize to implement positive change in Wisconsin's renewable energy landscape. Improve the state's outdated interconnection requirements. We are proud of our work to organize Wisconsin's renewable energy stakeholders into a community that speaks with one voice. But we need your active participation to advocate on your behalf. Please become a RENEW member by making a tax-deductible donation to RENEW: Join RENEW. Help us push the renewable energy envelop in Wisconsin to a new level for the remainder of 2012. Feel free to contact me with suggestions or if there are ways that RENEW can assist you. 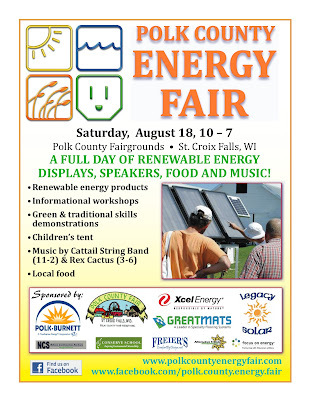 RENEW Wisconsin invites our members and other renewable energy supporters to our membership meeting at the Polk County Energy Fair, 1:00 p.m., August 18, in St. Croix Falls. If you are not yet a member, please Join Today! For the meeting's highlight, I'll release an evaluation of major Wisconsin utilities' commitment to renewable energy -- Xcel actually does reasonably well -- and invite area media to cover the evaluation announcement, meeting, and fair. Chippewa Valley Alternative Energy, a small, family-owned business in west-central Wisconsin, has been involved in the alternative energy field in for over 25 years, and has been heavily involved in many aspects of thermal, pyrolation and gasification energy technologies; and, Jeff Peterson, a RENEW member, are sponsoring RENEW's membership/public meeting at the Polk County Energy Fair, August 18, at 1:00 pm in St. Croix Falls. After skidding below $2.00/MMBtu this winter, wholesale natural gas prices are now creeping toward the $3.00 mark. This upward movement is the result of below-normal volumes of natural gas going into storage for the winter heating season. The latest report, released August 16th, marks the 16th straight week where injection volumes lagged significantly behind the five-year average. Notwithstanding this mild rebound, everyone in the energy industry, including the traders themselves, knows that $3.00/MMBtu is well below the cost of producing natural gas, and cannot deliver a return that can support future drilling efforts. This is particularly true with shale gas, the so-called “game-changer” that industry flacks contended would topple King Coal’s reign over the electricity sector. High-profile shale gas producers like Chesapeake Energy are now running out of ways of concealing their financial distress. Consider the following developments that occurred over the last fortnight. The most recent count of rigs drilling for natural gas in the United States is 495, down 70% from the record-setting levels seen in September 2008. “Write down” is a fairly bloodless way to describe the loss of $3 billion; “carnage” is better at conveying the pain that now grips the natural gas sector. This begs the question: why are wholesale natural gas prices still under the $3.00/MMBtu level? I believe that there are two reasons for this phenomenon. The first is that energy traders, like virtually everyone else in this country, are truly convinced that the United States is awash in shale gas, thanks to a brilliant industry-led public relations campaign. Lower prices help reinforce the popular belief that cheap gas will be with us for another century. Unfortunately, federal energy agencies and universities have also bought into this view of the supply picture big-time, leaving little room for skeptics and agnostics to influence public perceptions. This overarching belief has been unintentionally reinforced by local and regional controversies over the practice of hydraulic fracturing solid rock to obtain the shale gas trapped inside. Virtually unheard of four years ago, “fracking” has vaulted into the public consciousness, and in doing so, sustains the society-wide belief that natural gas can be accessed almost anywhere in the United States. Ironically, the myth of abundance that E&P companies so carefully cultivated--and bankrolled--is now clearly working against their short-term interests. The other factor that keeps prices so low is the traders’ fear of large demand swings. For example, the phantom winter of 2011-2012, which cut demand for heating fuel by more than 25%, creating a colossal oversupply that sent wholesale prices crashing. The supply pendulum is now swinging the other way, and more than half of the bulge has melted away. Assuming a continuation of smaller-than normal injections, natural gas inventories should be in line with the five-year average by mid-December. Traders attribute the ongoing reduction in inventories to a hotter than normal summer, prompting utilities to switch on more gas generators to meet system peaks. But weather isn’t the only thing that influences the storage picture; output does as well. But as long as traders and speculators subscribe to the myth of nearly limitless supply, they will discount the possibility that declining output is also responsible for lagging storage volumes. The paradigm shift ushered in by the fracking phenomenon won’t go away easily. But in the not-very-distant future, the reality of reduced drilling activity and capital spending, along with rapid decline rates in shale gas plays, will bite deeply into natural gas supplies and cause yet another overturning of expectations in this sector. For electric utilities as well as end-users, the results will not be pretty. Wholesale natural gas prices are once again flirting with the $3.00/MMBtu mark after the Energy Information Agency (EIA) reported this week that working gas in storage increased by 24 billion cubic feet (bcf) over last week’s totals. Compared with the five-year average of 45 bcf for the first week in August, the volume injected is modest. The August 9th report marks the 15th week in a row where the weekly injection volumes trailed the five-year average by a minimum of 20 bcf. On the trading front, the trend this summer has been a steady upward drift punctuated by sharp sell-offs whenever gas prices momentarily settle above $3.00. The last week in July was a case in point. Though the reported number for that week (28 bcf) was only half the five-year average for that date, the announcement triggered a pullback of nearly 10% down to $2.80 from $3.10. It turns out that EIA’s number came in 5 bcf higher than the traders’ own estimate, triggering a wave of serious unloading of positions by those who had bet long. Everyone in the energy industry, including the traders themselves, knows that $3.00/MMBtu is well below the cost of producing natural gas, and cannot support exploration and extraction activity at the level we saw in 2008 through 2010. Producing shale gas, the so-called “game-changer” that industry flacks contended would loosen King Coal’s grip on the electricity sector, is an even more expensive proposition. High-profile exploration and production (E&P) companies like Chesapeake Energy tried to maintain a jaunty look while wholesale prices were scraping along the $2.00 floor, but they can no longer conceal their distress. Consider the following developments that occurred over the last fortnight. The most recent count of rigs drilling for natural gas in the United States is 498, nearly 70% off the levels seen in September 2008, when prices were above $10/MMBtu. “Write down” is a fairly bloodless way to describe the loss of $3 billion; “carnage” is better at conveying the pain that now grips the natural gas sector. This begs the question: why do wholesale natural gas prices appear to be trapped for now at the $3.00/MMBtu level? I believe that there are two reasons for this phenomenon. The first is that energy traders, like virtually everyone else in this country, are truly convinced that the U.S. is awash in shale gas. The industry-led campaign to persuade Congress, state legislatures, Wall Street, Big Media, utilities, and Joe Sixpack that the United States possesses a 100-year supply of natural gas has been a stunning success. Federal energy agencies like EIA have also bought into this view of the supply picture big-time, leaving little room for skeptics and agnostics to influence public perceptions. This overaching belief has been unintentionally reinforced by local and regional controversies over the practice of hydraulic fracturing solid rock to obtain the shale gas trapped inside. Virtually unheard of four years ago, “fracking” has vaulted into the public consciousness, and in doing so, sustains the society-wide belief that natural gas can be accessed almost anywhere in the United States. Ironically, the myth of abundance that E&P companies so carefully cultivated (and bankrolled) is now clearly working against their short-term interests. The other factor that keeps prices so low is the traders’ fear of large demand swings. This is a more legitimate if somewhat overblown fear. The two main reference points for traders here is the demand destruction that occurred in 2008 from the one-two punch of double-digit gas prices and worldwide recession, and the abnormal bulge in storage volumes that occurred earlier this year. As late as September 2011, natural gas inventories were tracking closely with the five-year average for storage volumes. Then came the phantom winter of 2011-2012, which brought us the usual dose of darkness but not the snowstorms and frigid air masses that make life in the Upper Midwest distinctly unpicniclike until April. In addition to disrupting seasonal cycles and ruining the maple syrup harvest, the extended stretches of anomalous warmth cut demand for heating fuel between 25% to 30%. Withdrawals of natural gas were substantially lower than the five-year averages during the heating season, creating a colossal bulge that briefly sent wholesale prices skidding below $2.00/MMBtu. By late April, the difference between 2012 storage volumes and the five-year average stood at 931bcf, about 60% larger than normal. On May 1st, the pendulum started swinging the other way, whittling down the supply overhang to a more manageable 377 bcf compared with the five-year average for this week. Assuming present trends continue in future weekly storage reports, inventories should be in line with the five-year average by mid-December. Traders attribute the ongoing reduction in inventories to a hotter than normal summer, prompting utilities to switch on more gas generators to meet system peaks. But weather isn’t the only thing that influences the storage picture; output does as well. But as long as traders and speculators subscribe to the myth of nearly limitless supply, they will discount the possibility that declining output is also responsible for lagging storage volumes. It is this mindset, coupled with the fear of weather-driven demand swings, that compels traders to focus on the supply overhang that remains, rather than gain a fuller appreciation of why it has shrunk so dramatically in only 15 weeks. Old paradigms die hard. But in the not-very-distant future, the reality of reduced drilling activity and capital spending, along with rapid decline rates in shale gas plays, will bite deeply into the supply of natural gas and cause yet another overturning of expectations in this sector. Given the damage being inflicted on E&P companies as well as their renewable energy competitors, the intrusion of reality into this picture can’t happen soon enough. Ironically, the myth of abundance that E&amp;P companies so carefully cultivated--and bankrolled--is now clearly working against their short-term interests. Chippewa Valley Alternative Energy is a small, family-owned business in west-central Wisconsin. It has been involved in the alternative energy field in for over 25 years, and have been heavily involved in many aspects of thermal, pyrolation and gasification energy technologies; and, Jeff Peterson, a RENEW member, are sponsoring RENEW's membership/public meeting at the Polk County Energy Fair, August 18, at 1:00 pm in St. Croix Falls. It is not surprising that the proposed Windy Acres Wind Farm project in the Town of Sherman has become a highly emotional debate. However, as a citizen, tax payer and small business owner in the Town of Sherman, I am concerned about the vast amount of misleading information that is being circulated throughout our community. We’ve been barraged with flyers of burning wind turbines, yet the likelihood of this occurring is less than .001% based on 165,000 wind turbines installed worldwide. By comparison, our local fire department was dispatched to two car fires this month alone. We’ve heard about the wind turbines affecting our property values, however an independent study conducted by the firm Poletti and Associates recently concluded otherwise. In Kewaunee County, which hosts two of the oldest commercial wind projects in the United States, their report suggests no statistically significant effect on the sale of homes or construction of new homes. Furthermore, there is no credible evidence that existing wind development in Wisconsin has depressed property values statewide. In fact, according to data compiled by the Wisconsin Taxpayers Alliance on property values and levies, in Fond du Lac County, equalized valuation actually increased by 1.2% during that time, while Dodge and Kewaunee counties managed smaller declines than the statewide average during that period. Senator Grothman recently insinuated that a wind farm was not welcome in the Town of Sherman. Considering that the July 24 town meeting was attended by more people from Brown County, Manitowoc County and other areas outside our township, I find the senator’s assessment quite presumptive. He may be interested in knowing that recent polling shows that 85% of his fellow Wisconsinites support an increased use of wind power to meet our energy needs, because wind power provides safe, homegrown energy and creates family-supporting jobs across the state. A more than 400-acre property in the Town of Sherman could become home to Sheboygan County’s first commercial wind farm. A Hubertus-based developer, EEW Services, LLC, told leaders of the southern Sheboygan County township this week that it intends to submit a formal application to begin construction there next year on the Windy Acres Wind Farm. Under the proposal, four wind turbines would be built on a stretch of land located east of state Highway 57, west of county Highway CC and north of county Highway A.
William Rakocy, managing member of EEW Services, said the site is well-suited for a wind farm due to its wind capacity and proximity to transmission infrastructure. “The first thing we look for is adequate wind resources, and the second thing we look for is adequate transmission and then thirdly, willing participants,” he said. The wind farm would produce between nine and 12 megawatts of electricity, or enough power for about 4,000 average residential homes. The turbine blades would reach as high as 500 feet and connect to a substation in the Town of Holland. Highland Wind Farm is a $250 million proposed wind project for the Town of Forest in St. Croix County, Wisconsin. It will generate 102.5 megawatts of electricity from 41 turbines. Developers of the proposed Highland Wind Farm in the Town of Forest, Wis. will not be required to complete an environmental impact statement. The Public Service Commission of Wisconsin issued a decision on the possible EIS requirement on July 25. Forcing an EIS typically slows down the approval process for such projects. With last week’s decision, final approval of the 41-turbine wind farm might come in the next few months. Jay Mundinger, founding principal of the Highland Wind Farm project, said he was very pleased with the news. Highland developers have worked with expert consultants to design and install the project in such a way that it would have little or no impact on the community, Mundinger said. He said the PSC apparently recognized that is the case as well. “We’ve worked hard to protect the environment,” he said. The PSC’s preliminary environmental assessment acknowledged that the large turbines would “affect the visual character” of the township. There may also be some increase in “ambient noise” near the turbines and “shadow flicker” (the blinking created on homes as the sun is blocked by the twirling blades) when the project is installed, the report concedes. There would also likely be some bird and bat losses as a result of the turning turbines, the report states. GRANT COUNTY, WI (WTAQ) - Wisconsin’s largest electric utility will spend $27 million to buy an existing wind farm in the southwest part of the state. Wisconsin Energy, the parent of We Energies, has agreed to buy the Montfort Energy Center near Montfort in Grant County. NextEra Energy Resources of Florida currently owns the facility. It opened 11 years ago, and it now has 20 turbines that provide enough power for about 9,000 homes. We Energies’ CEO Gale Klappa says the wind farm will deliver positive benefits for both customers and shareholders. It will also help the utility meet its state-mandated requirement to produce 8.25 percent of its power from renewable sources by 2015.